Mike Collins was the third man in the historic Armstrong and Aldrin Apollo 11 mission that put the first men on the moon on July 20, 1969. As pilot of the command module Collins circled in lunar orbit until Armstrong and Aldrin returned in the lunar launch craft. Collins was also the first man to space walk from one spacecraft to another (Gemini 10, July 1966). In 1970 Mike Collins retired from the Air Force and left NASA. After a brief stint as Assistant Secretary of State for Public Affairs, he served as the first Director of the Smithsonian Institution's National Air and Space Museum (1971 to 1978). 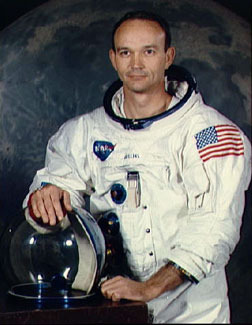 Collins has also authored several books about space, including Liftoff, Space Machine and the acclaimed Carrying the Fire.